Earlier in February, cyclocross, MTB and grass track racer Craig Hardie announced on facebook that he had taken the decision to give up racing. Despite his humble comment that he didn’t want to seem big headed by making a big announcement, he has nonetheless had a long amateur racing career and been an integral part of the competitive scene for many years. Craig’s enthusiasm for cyclocross and biking in general gave me encouragement personally, so I thought I’d find out more. > You said that you needed a better work/life balance – that’s something that I and, I’m sure, a lot of other amateur racers (and their partners) can sympathise with. Yep it has come to the time to the feeling I have done all I can in Scotland Cyclocross, the last Cross season kind of sealed the idea of giving up the endurance based racing (will still maybe compete in a few Highland Games this season depending on time and how I feel) The time to train as much as I would like is just not there now but I feel very satisfied I have achieved more than I could have imagined. > You’ve been racing a long time, back to mountain biking in the 90s, is that right? > What were the high points? Been a few over the years, my first MTB Scottish Champs win at Hawick was one and a particular fond memory winning the Scottish Cyclocross Champs at Plean in 2007 after being totally sidelined for most of the year with back problems. > Sorry to ask, but any lows? Real low point was my back problems that had me not able to walk for a while and thinking I would not Cycle again never mind race, thankfully it was short lived but at the time it felt bad. Another low point was the 2002 Commonwealth Games which were to be held in Manchester and MTB X-country was the discipline I was going for, in the end Scottish Cycling sent no male MTB riders citing we were not a medal contender. I think after all the racing I have competed in it’s the one thing that really bothered me, as the Games were just down the road it didn’t make sense. I remember talking to English, Welsh and Irish riders who could not get their heads round that Scottish Cycling had not filled the allocation of riders to compete at the Games. > Will we still see riders in the Hardie Bikes red and white? Of course, hopefully I can pass on some knowledge to the newer generation and anyone that wants to compete or just ride, the Team is a small one but all the guys and girls really enjoy their biking and that is the main thing. > You mentioned passing on knowledge to youngsters – I think the futureof the sport is looking bright in Scotland, what do you think? There is certainly a lot going on in the youth side which is great but there seems to be nothing after this and between the ages 18-20+, important time where a lot of youngsters get lost to the sport. > And what about the future for yourself- obviously you’ll still cycle – but what will you enjoy most now that training and racing aren’t there? Yeah, will still be Cycling all the time as I love it. Could pop up in some fun events for a laugh in the future if I fancy but the serious training and looking to events is finished, as mentioned the odd Grass Track events but will see what time is available. Looking forward to be more of a spectator at races and helping out with the HardieBikes Team riders at events when needed. Of course there is always Strava to keep me interested! – Thanks to Craig for taking the time to answer a few questions. 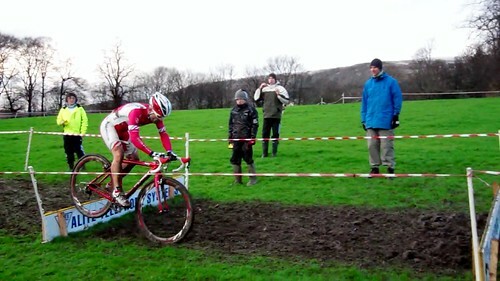 This entry was posted in Amateur cycling and tagged amateur racing, cyclocross, grass track on February 24, 2013 by Owen.